The Kommersant business daily cites White House press secretary Josh Earnest as saying that the United States believes Russia's only friends in the world are the governments of Iran and Syria. "The condition of the Russian economy is deteriorating. Russia is seriously isolated. 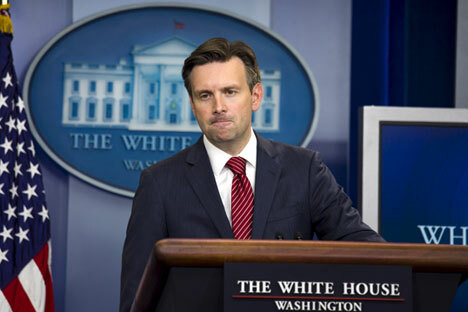 And this is the effect not only of European countries," Earnest stated on Oct. 29 during a briefing. He also remarked that, "as Russia further submerges into the internecine quagmire in Syria, it will realize that its only friends, those who are ready to fight along its side, are the floundering Syrian government and the Iranian regime." According to the U.S. government, "Russia today does not have the influence in the world that the USSR once had." This is precisely why there can be no talk now of a new Cold War between the U.S. and Russia. Speaking about the Russian military operation in Syria, Earnest said the US has information that "Russia is continuing the bombing of the opposition" and not the objects of the IS terrorist group. He also stated that the situation in Syria will not lead to a proxy war with Russia. Meanwhile, Russian Foreign Minister Sergei Lavrov recently denied the thesis that Russia is isolated. "We have allies in the post-Soviet space, in the CSTO. We are not closing ourselves up before anyone. Now our partners are beginning to understand the futility of their sanctions policy and their attempts to isolate Russia." Bernard Kouchner, French Foreign Minister from 2007 to 2010 and founder of Medecins Sans Frontieres, has given an interviewto liberal daily Novaya Gazeta about the prospects of a thaw in relations between Europe and Russia. On the subject of Crimea, the diplomat said that Putin "will never return it" and that "it is necessary to find a compromise." "You can obtain anything through war. But we didn’t want to counter Putin's policy with the Ukrainian armed forces. We didn't want to give a military response because we think (and I support this opinion) that war in Europe is not a solution," he said. Kouchner added that the sanctions imposed by the West as a retaliation for Russia’s actions in Crimea and the Donbass region of eastern Ukraine do not do any good for "the Russian middle class and for the people who were already poor. They don't affect the Cote d'Azur-type Russians. Is this just?" "Mr. Putin's power politics deserve condemnation, I condemn them, but I don't intend to start a war campaign against Russia in France," said Kouchner. Speaking about Russia's operation in Syria to fight the Islamic State (ISIS) radical militant group, the diplomat claimed that "the U.S. doesn't know what to do with Putin in Syria. He's turned the whole game upside down." "Our actions are also inconsistent,” he told Novaya Gazeta. “On the first day Russian planes bombed the positions of the al-Nusra Front and we stated that it's not good to bomb them because they are fighting Assad. Since when is Al-Qaida our ally? How do you want people to interpret this?" The Moskovsky Komsomolets tabloid reports that following an incident involving the Library of Ukrainian Literature in Moscow in which the authorities found a book that was included on a list of extremist material, a similar situation has occurred at the First Scientific-Technical Library of Moscow. According to the library’s director Artyom Akshintsev, the library received a call from the Central Library System asking it to remove a book written by Doctor of Historical Sciences Sergei Abashin, Nationalism in Central Asia: in Search of an Identity. Akshintsev believes that someone who had not read the book was bothered by the word "nationalism" in the title of a purely academic work. Within the upcoming month the book will be examined, after which it will be clear whether it can be offered to readers. On Oct. 29 Natalya Sharina, director of the Library of Ukrainian Literature, was detained. Investigators believe that from 2011 to 2015 she had been distributing literature that in Russia is considered extremist. In particular, the matter concerned Dmitry Korchinsky's book War in the Crowd.